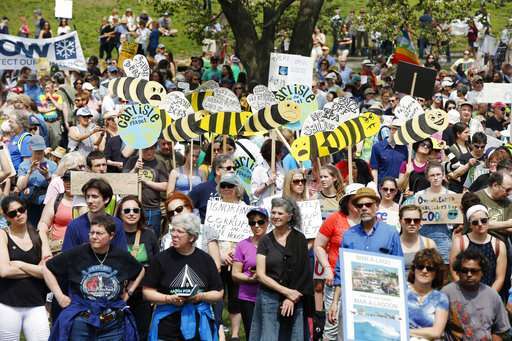 Thousands of people across the U.S. marched in rain, snow and sweltering heat Saturday to demand action on climate change—mass protests that coincided with President Donald Trump's 100th day in office and took aim at his agenda for rolling back environmental protections. 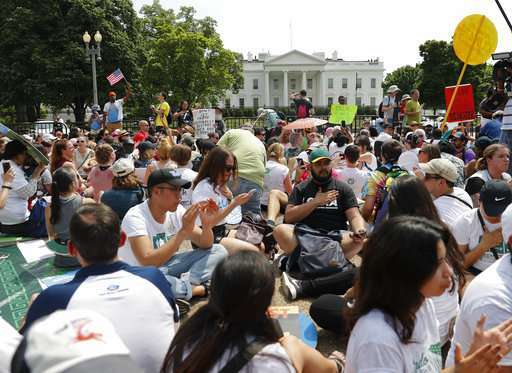 At the marquee event, the Peoples Climate March in Washington, D.C., tens of thousands of demonstrators made their way down Pennsylvania Avenue on their way to encircle the White House as temperatures soared into the 90s. Organizers said about 300 sister marches or rallies were being held around the country, including in Seattle, Boston and San Francisco. 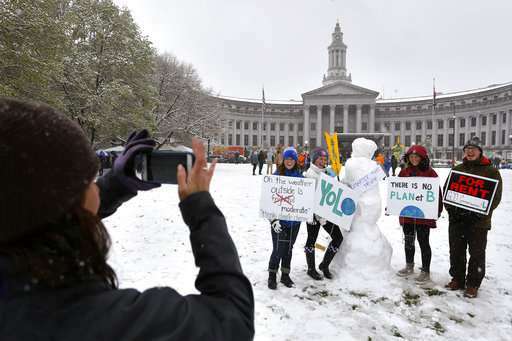 A wet spring snow fell in Denver, where several hundred activists posed in the shape of a giant thermometer for a photograph and a dozen people rode stationary bikes to power the loudspeakers. 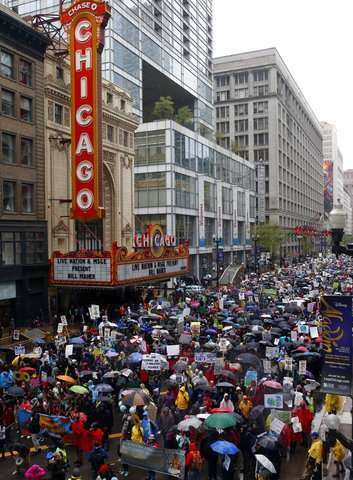 In Chicago, a rain-soaked crowd of thousands headed from the city's federal plaza to Trump Tower. "We are here because there is no Planet B," the Rev. Mariama White-Hammond of Bethel AME Church told a rally in Boston. 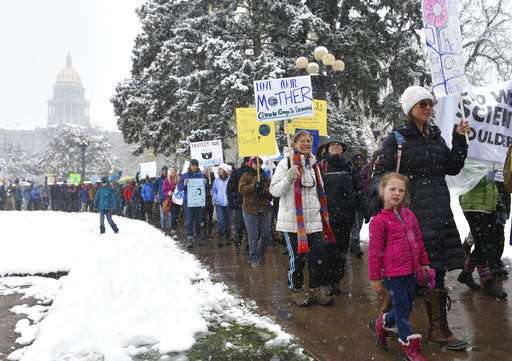 The demonstrations came one week after supporters of science gathered in 600 cities around the globe, alarmed by political and public rejection of established research on topics including climate change and the safety of vaccines. 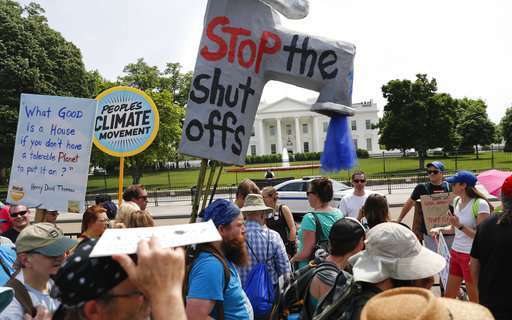 Participants Saturday said they object to Trump's rollback of restrictions on mining, oil drilling and greenhouse gas emissions at coal-fired power plants, among other things. Trump has called climate change a hoax, disputing the overwhelming consensus of scientists that the world is warming and that man-made carbon emissions are primarily to blame. 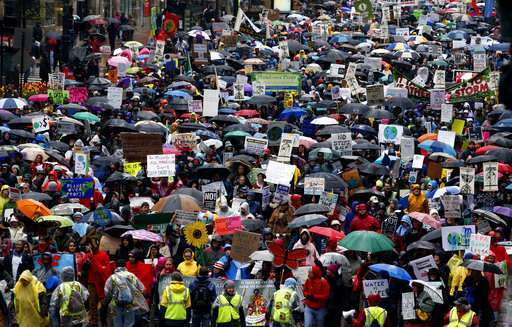 Among those attending the Chicago rally were members of the union representing Environmental Protection Agency employees. Trump has proposed cutting the EPA's budget by almost one-third, eliminating more than 3,000 jobs. 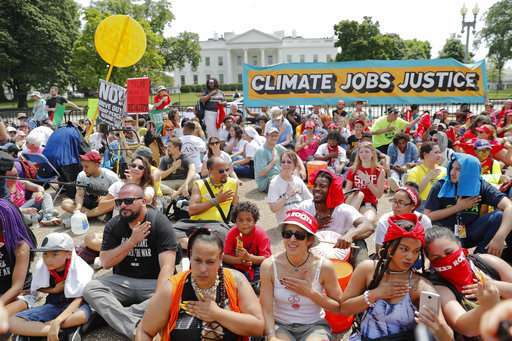 John O'Grady, president of the American Federation of Government Employees Council 238, called the march "a chance to speak out in unity against this administration" and its "ridiculous gutting of the EPA budget and staffing." More than 2,000 people gathered at the Maine State House in Augusta. Speakers included a lobsterman, a solar company owner and members of the Penobscot Nation tribe. "I've seen firsthand the impacts of climate change to not only the Gulf of Maine, but also to our evolving fisheries, and to the coastal communities that depend upon them," said lobsterman Richard Nelson of Friendship, Maine. People in the crowd spoke about the importance of addressing climate change to industries such as renewable energy, forestry, farming and seafood. Saharlah Farah, a 16-year old immigrant from Somalia who lives in Portland, talked about how climate change could have a bigger toll on marginalized groups that have less financial resources. "But I see untapped power here today," she said. 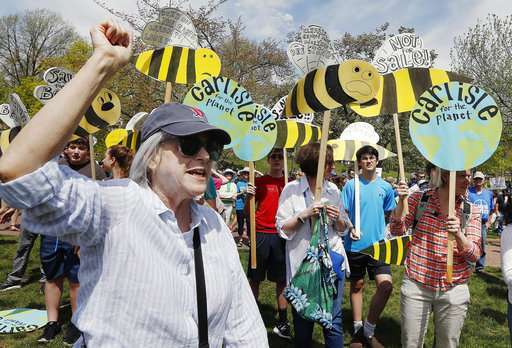 A demonstration stretched for several blocks in downtown Tampa, Florida, where marchers said they were concerned about the threat rising seas pose to the city. 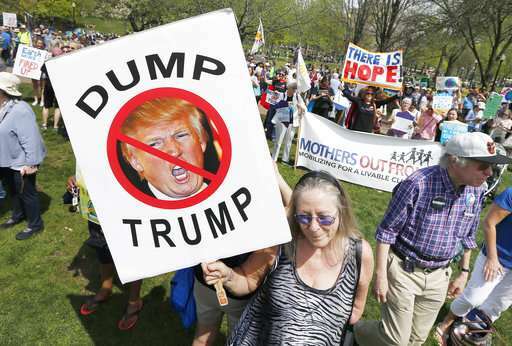 People gathered on the Boston Common carried signs with slogans such as "Dump Trump." Handmade signs at Seattle's march included the general—"Love Life"—and the specific—"Don't Kill Otters." 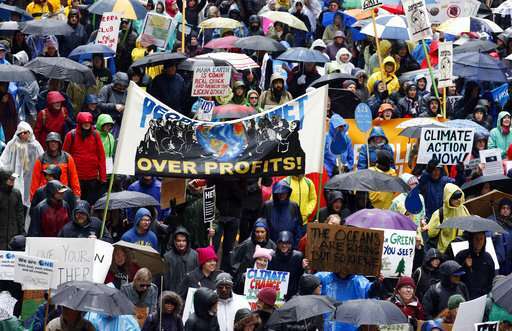 Some of the marches drew big-name attendees, including former Vice President Al Gore and actor Leonardo DiCaprio in the nation's capital. In Montpelier, Vermont Sen. Bernie Sanders called the marches part of a fight for the future of the planet. "Honored to join Indigenous leaders and native peoples as they fight for climate justice," DiCaprio tweeted.